When you go on vacation and stay at a hotel, you may request a room with a view. But when you live in a high rise, you can feel like you're on vacation every day – as long as you make the most of the view with interior shades. Your quest for privacy might depend on which floor you reside as well as the proximity of nearby buildings. If you have a street-level view of an encroaching neighbor, you might prefer greater screening than someone who lives on the 20th floor and whose closest neighbor is blocks away. In all cases, shades can easily provide the degree of privacy you desire. Light, airy spaces draw many people to high rises in the first place. But you probably don't want to wear your sunglasses indoors, either. Balance your preference for light with the understanding that the more you close off natural light, the more you will depend on electrical light. Since shades control how much light enters a room, they also affect the room's temperature. Depending on your own internal thermostat, you might wish to block excessive summer sun but capitalize on the winter sun in your high rise. If your bedroom faces east, you either love the early morning sun or want to block it out. If your living room faces south and your windows are left uncovered, it will absorb a great deal of solar heat as the sun passes overhead. If that room faces west, you won’t want to walk into an overheated sauna at the end of the day. In all cases, blackout shades might be right for you. If you have children or pets, motorized shades eliminate the safety hazard of dangling cords. Motorized shades also offer unparalleled convenience, allowing you to open and close your shades with the push of a button and even from your cell phone. If your high rise features an abundance of windows short or tall, motorized shades will expand your definition of convenience. Shades complement any decorating style, and because they're available in a wide range of colors, your options naturally multiply. 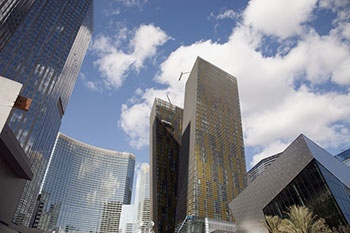 Call Polar Shades at 702-260-6110 for a free consultation – and begin forming a new view of your high rise.